CHAPEL HILL, NC (WTVD) -- The Chapel Hill Police Department has arrested two men in connection with an armed robbery Tuesday afternoon. 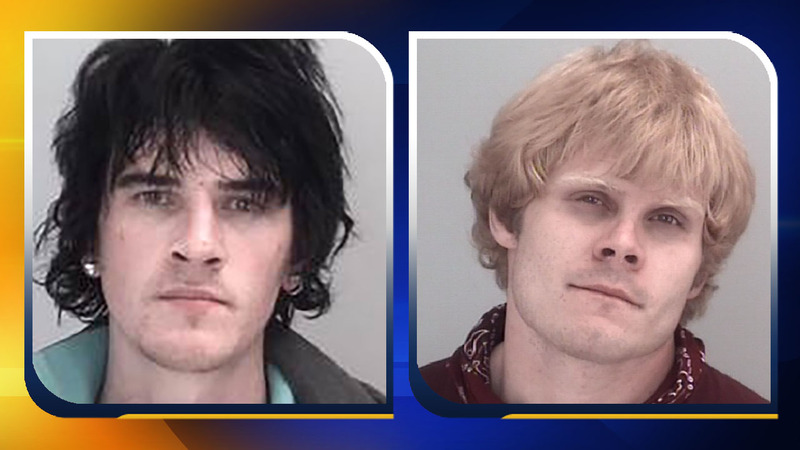 Joshua Allen Chavis, 28, of Raleigh, and Sean Thomas Klinek, 27, of Apex, were both charged with robbery with a dangerous weapon and conspiracy to commit robbery. Around 4 p.m. officers were called to the Glen Lennox Family Fare BP gas station in the 1200 block of Raleigh Road. Police say a man armed with a gun, wearing dark clothing and a mask robbed the business. The suspect then fled the store, where a nearby officer saw the man wearing clothing that matched the description enter into a truck nearby. The man then removed his clothing and hid in the seat. Officers recovered the clothing, two weapons and the money stolen from the business during a traffic stop. The two suspects were arrested without incident. Chavis and Klinek are being held at the Orange County Jail under a $250,000 secured bond.